There is something with the change of seasons that inspires me to try new recipes. I went grocery shopping yesterday and picked up a few magazines and now I want to cook some new dishes. The fallish kind that warms your insides. Anyways, I finished the Picoult book Sing You Home and it was okay. That is all I'll say about the book. Lamott's book never fails to make me laugh and think at the same time so she's all good reading for me. My knitting is coming along. The socks for my son are going and I do believe I will run out of yarn, but no worries. I'll just dig through that massive odds and ends of sock yarns in my basket to complete each sock. This shawl is my savoring knitting, I am enjoying each blessed stitch. 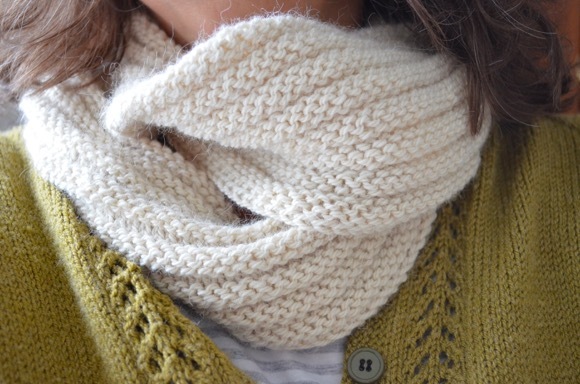 I love the short row shaping and the two colors paired together are growing on me! What are you knitting and reading this week?? I love to try new recipes so please let me know if you find a good one. Yesterday I prepared dinosaur kale, chick pea soup and it was a keeper. Just threw everything in the pot with some vegetable broth and chopped garlic, let it simmer for an hour and served. Yum. 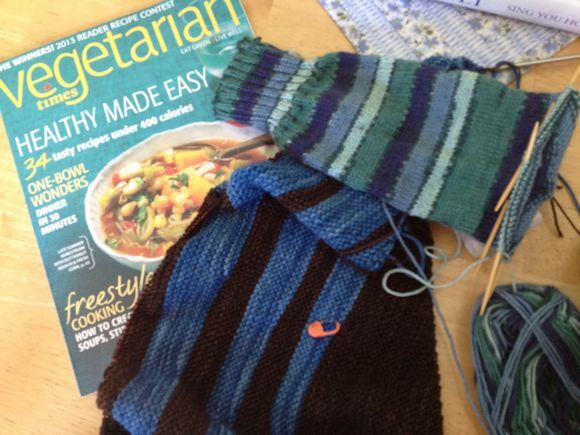 I have knit socks from the same yarn in your picture! :) They have held up well. So many pretty greens and blues! I am getting into the "Fall" mode of cooking too. I have visions of apple crisp and pumpkin pie. Yummmmm!!! I so love the color way with the earthy browns and the deep blues very pretty. We ate kale, onion, garlic with lemon and risotto yesterday- delish- been a vegetarian for over 3 years and have never looked back. This is a great mag- you'll find a ton of inspiration. I love trying new recipes as well - if it wasn't for some of the pickier eaters here, I would do it more often. If you find a yummy recipe, would you share it with us? I love new recipes and reading cookbooks/cooking magazines is one of my favorite things to read! oh, gosh, i think i've used that yarn for socks.......if the bits haven't been incorporated into that miserable linen stitch scarf.....i'd be happy to send what i have left over.....let me know if you need some and i'll look! I love that term, "savory knitting." It's so perfect. What a sweet gift to make socks for your son. 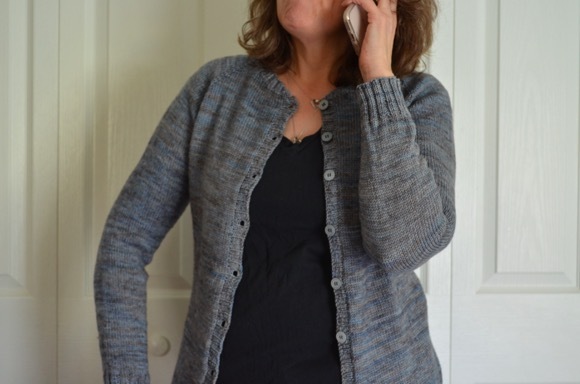 I love the blue and brown together in your shawl. Our weather turned mild this morning. I hope it stays a while. That bowl of soup on the cover looks delicious. So good to know someone else still buys magazines! I just bought Cottages and Bungalows Fall! I'm a sucker! I feel the same about cooking, I think I just enjoy it more as it gets colder! Not that there is any sign of autumn in the air yet here..
Yay socks! I love sock knitting so much. I love the brown and blue together. And I also love your magazine, I always find a recipe or two in it to try, and they are always well enjoyed. Have fun experimenting. S L O W to savour it. PS I won't bother picking up Sing you Home thanks for heads up. Nice colours you are working with. Loving the two blues in the shawl. I personally really love the shawl colors. And eclectic socks are more fun. I have been feeling the urge to try new recipes too... let me know if you come across anything fabulous! Im reading a tiny bit: Homer the blind cat story. and The Jefferson's book on Sally Hemings.